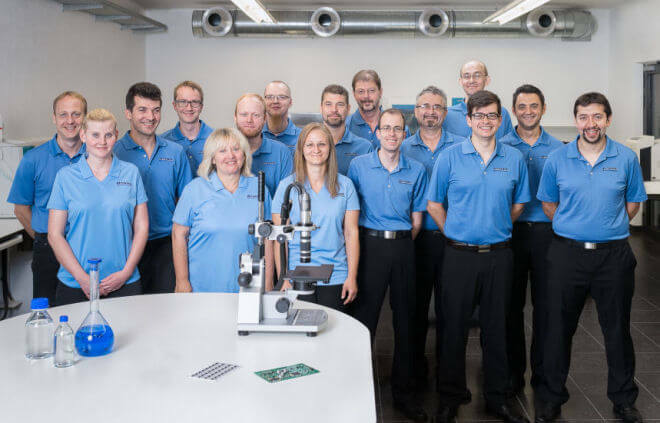 Take advantage of ZESTRON’s globally unique Machine Test Centers which offer you the opportunity to get an overview of all possible processes for cleaning SMT and power electronics as well as perform cleaning trials – all within one day. We have eight machine test centers worldwide in the USA, Germany, China (Shanghai and Shenzhen), Malaysia, Japan, Korea and Taiwan, that are equipped with more than 70 cleaning machines by international manufacturers and available to you for free cleaning trials. We offer all technologies including spray-under-immersion and ultrasonics as well as spray processes in inline and batch machines. With years of experience in equipment technologies and chemistry, our process engineers work closely with you to develop a customized cleaning process that meets your specific requirements and budget. To accomplish this, we invite you send us your substrates for testing or to schedule an appointment at one of our Technical Centers. Following the cleaning trials, we will test the surface cleanliness of your substrates by using the latest analytical methodologies at our Analytical Center. Subsequently, we will summarize the results in a detailed written technical report that also includes process recommendations. We invite you to take a virtual tour of our Technical Centers that are equipped with more than 70 state-of-the-art cleaning machines and numerous analytical methodologies. Use this one-of-a-kind tool to view the facilities at each location. This includes the analytical, quality control, development, and research centers that we have worldwide. Select a location and take a tour of the facility.